The CZ1000 Cable Pair Identifier (F-Set) is the original and best cable tracer and pair identifier used by electricians, telecommunications, and data cabling companies Australia wide. Designed for finding conductors in multi pair cabling applications, particularly in copper telecommunication cables, it soon became the standard tone and probe for telecommunications. Once electricians realised how good it was as a cable tracing tool it soon became the standard cable tracing tool for the electrical industry. Electricians, technicians, engineers, and tradespeople all rely on the CZ1000 to get their daily jobs done. The CZ1000 was a world first when developed, and has now been the industry standard for more than 25 years. Designed by Australian manufacturer Aegis, the CZ1000 is suitable for and compatible with copper cable networks and systems worldwide. It is the market leader with a strong heritage and proven quality, beating out its competitors in terms of value for money, time and time again. There are many tone and probe products on the market but none can match the CZ1000! The simplicity of the CZ1000 is a major component of its longstanding success. The set comprises of two main items, a transmitter and search probe. The transmitter is connected to the cable to be traced via either crocodile clips or a RJ11 plug. This connection provides the tracing signal which the probe can then detect. The probe is activated by a push button switch. A warble tone will be heard when the tip of the probe is over the wanted cable or pair. The new tone on short feature gives confirmation of the identified pair by triggering an audible buzzer at the transmitter when the pair is shorted together. Not to be overlooked is the carry case supplied with the CZ1000.The durable, hard carry case integrates the operator manual and makes for easy storage and transport, protecting your CZ1000 from damage at all times. 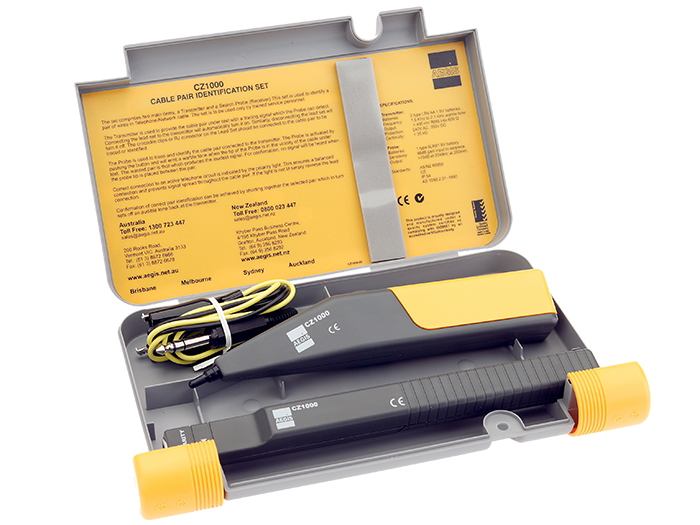 The CZ1000 is suitable for data, electrical, and telecommunications cables and enables connection to the most common terminations with ease. The CZ1000 has a long service life and uses standard batteries available from most retail outlets. It is already the preferred Cable Pair Identifier for the Australian telecommunications industry, the preferred cable tracer for the Australian electrical industry, and the preferred tool for Australian networking technicians. It has gained a reputation as the best tool in the market based on its high quality, ease of use, and numerous applications. For more information about the specifications of the CZ1000, please download and browse our CZ1000 Data Sheet.